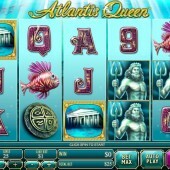 Underwater-themed slots always make for an interesting online slot. After all, developers have a seemingly endless source inspiration at their multi-talented fingertips: fish, pearls, mermaids, sunken treasure, shipwrecks – the list goes on. Slot developer Playtech have always known what side their bread is buttered, and the leading slots firm’s 5 reel, 25 pay-line aquatic slot is certainly up there with the best of them. It mixes myth and legend with fun slots gaming on a level that will relate to the majority of slots players out there. Playtech know what players want and in this slot they deliver exactly what the players want. The graphics and game play both tick all the boxes and this is definitely a slot you will want to get your hands on. 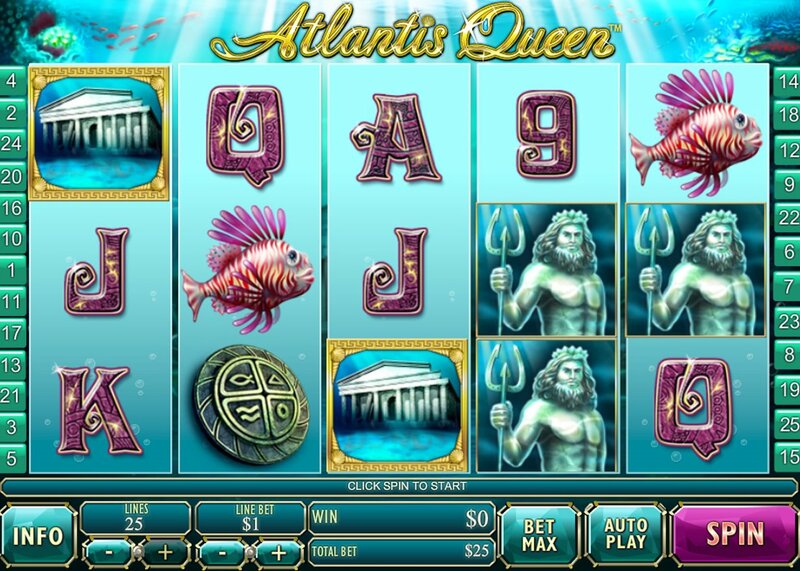 On the reels, Atlantis Queen is pretty much what you’d expect from a mermaid-obsessed slot: the titular Atlantis Queen is there, as well as treasure chests, a pissed-off looking Poseidon, fish and a hero’s shield. 10-through-Ace symbols make up the reels. There are two Wilds in Atlantis Queen: Poseidon – who substitutes for all symbols in the game other than the Scatters – and the Atlantis Queen. Poseidon is the juicy payer here, awarding a 5,000-coin jackpot when you hit five across the reels, but it’s the Queen you need to pay attention to. She only appears on Reels 2 to 4, but when she does on all three reels she’ll trigger one of the game’s bonus features. Here you’ll activate a fairly standard Pick ‘em Bonus round with nine special pearls to choose from. Cash prizes only can be yours. If that doesn’t float your pearl, there are free spins to be had in the game’s other bonus feature. Hit three Temple icons anywhere on the reels and you’ll have the chance at some free games. You’ll get to first pick how many spins you receive, a multiplier attached to them, plus a bonus Scatter and Wild that will play during the bonus round. Pick well and you can bag yourself 14 juicy freebies with a 3x multiplier attached. Whether it's the Finding Nemo-thon of Betsoft Gaming’s watery Under the Sea slot or the underwater thrills of Microgaming’s Mermaid's Millions, journeys through coral reefs and shimmering caves make for a good slot. Playtech’s Atlantis Queen can be fairly confident of joining those two on the list of must-swims for aquatic slots fiends.